You might have tried to connect with your neighbor's Wi-Fi in your life at least for once. Did you notice Wi-Fi router name? Was that funny? If not then it's time to surprise your neighbors with some clever, funny Wi-Fi router name. 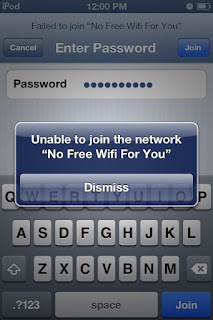 Hundreds of time I have noticed clever, funny, aggressive, hilarious and cool wi-fi names. Some creative people are in a habit to make their wi-fi name funny. If you will keep on noticing wi-fi names then you'll surely get amazed with cool Wi-fi names. This will make you so much curious that you will start looking for more and more funny Wi-Fi names. After having a keen study at the Internet I am having a collection of some cool, funny, aggressive, hilarious and best Wi-Fi names for you. Below is a complete list just check them out and amaze people with the most interesting router name. God Is Our Rock. He'll Save You ! Bill Bill! Bill! Bill! Bill! Caitlin Stop Using Our Internet ! So this was all about best funniest ever wifi names. Enjoy and if you have any cool router name then feel free to mention it in the comment section below. I named my network "Desperate HouseWiFi's"